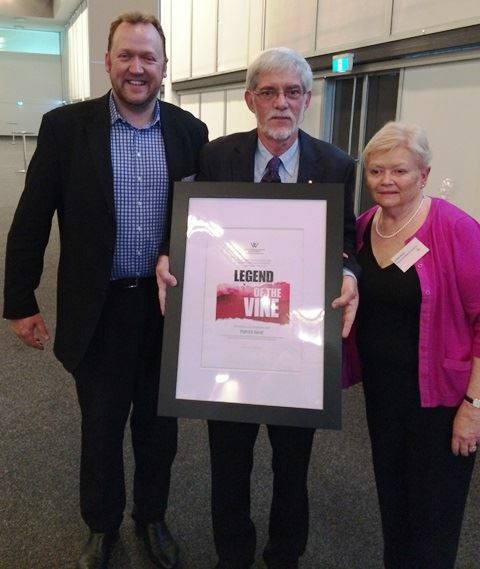 Wine Communicators of Australia (WCA) has announced the inaugural 2014 South Australian Legend of the Vine Award recipient as Adelaide educator and author Patrick Iland OAM. Dr Iland received the award in front of an audience of 310 wine industry peers and Adelaide corporate guests at the WCA Royal Adelaide Wine Show Award Winners Lunch today, held at the Ridley Pavilion, Adelaide Showground. The ‘WCA Legend of the Vine Award’ recognises a member of the wine industry who has made an outstanding and lasting contribution to the wine business and industry at large, as well as display a strong affinity for the objectives of WCA. WCA Deputy Chair Angus Barnes said WCA wanted to create an Award that acknowledges the passion, drive and leadership, particularly in communication, of a highly regarded individual in the Australian wine industry. “WCA’s maxim is ‘Engage, Connect, Learn, Inspire’. This industry has plenty to be inspired about and that includes the number of individuals who lead by example and add their own skilled and distinctive voice to the Australian wine story – and our South Australian Legend of the Vine is an outstanding example of this,” Mr Barnes said. Announcing the award at the Adelaide lunch, Mr Barnes described Dr Iland as being “an inspiration to many” during his 40-year career as a university lecturer, publisher and author. “As teacher and researcher in wine chemistry, viticulture and sensory evaluation at Roseworthy Agricultural College and then The University of Adelaide he helped launch the careers of many winemakers and viticulturists who continue to be instrumental in shaping the future of the Australian wine industry,” he said. WCA isn’t alone in acknowledging the work of Dr Iland. In 2007 he was awarded The Order of Australia (OAM) “For service to the wine industry through research, writing and the teaching of viticulture and oenology”. He is also a past winner of The Vin de Champagne Award, The Stephen Hickinbotham Memorial Trust Award (for his research in Pinot Noir grapes and wines) and the Stephen Coles the Elder Award for Excellence in Teaching awarded by The University of Adelaide. “Although Dr Iland is now retired from The University of Adelaide he remains involved as a Visiting Research Fellow and is Patron of the University of Adelaide Wine Alumni – an alumni for graduates of Roseworthy Agricultural College and the University of Adelaide,” he said. Dr Iland accepted and shared the award with his wife, Judith. As the 2014 Legend of the Vine recipient, Patrick Iland received life-time membership to WCA, joining a highly-respected list of names, which includes David Lowe, Phil Laffer, James Halliday, Chris Anstee and Lyndey Milan.